Another of my very fun neighbors at taste of Coeur d'Alene was Busarin of Silky Hut from Phoenix Arizona. 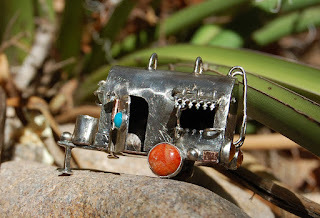 Busarin creates whimsical fine silver jewelry. "Creativity is everywhere. Pick a simple thing and make it remarkable, is what I lvoe to do for special people like you" says Busarin. From her Miss Pac Man series. 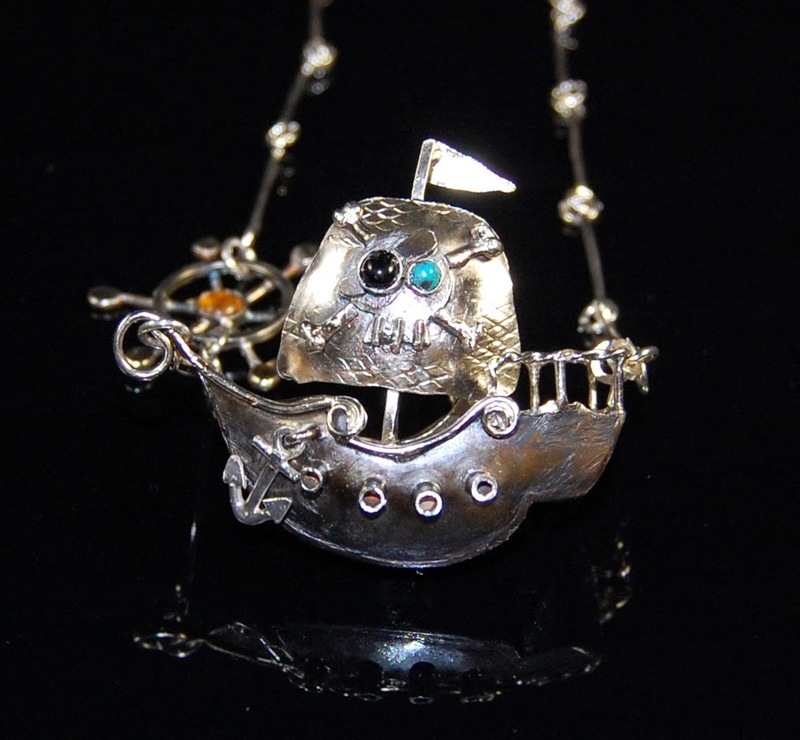 Pirate ship necklace from her nautical collection. I tackled another tedious job this weekend. Hard to do as I look out my office window and see the pretty blue sky and my weedy garden! I have updated all of my photo galleries listed on the right side of my blog. The best way to view them when on a computer is to right click so they open in a separate window. On my Android phone I need to scroll down to the bottom and click on web version to see those same links. Not sure about an Iphone. I have used Photobucket for years for this, but they have changed their format and I really dislike it. It is not user friendly so I apologize for that. Researching new options is on my to do list. If you have suggestions I would love to hear them! One note, these are photos of my past work and most of these pieces have sold. Also, most of my work is one of a kind. I have been able to recreate something similar if I still the same stones, but since most stones are unique making an exact copy is difficult. If you see something you like please send me an email and we can go from there. Happy browsing! When I was at the Taste of Couer d'Alene I had the funnest neighbors! That makes such a big difference in the enjoyment of doing a show. Across the isle from me was Margaret Aden and her Original Sin Jewelry. "The technique I use is an adapted basket weaving technique. Instead of using fiber, I use metal which has been drawn into gossamar threads and then woven and twined, free form and using my ten digits with an occasional hand tool. I pursue structure and texture using non-traditional settings to show off bumpy, sparkly, crunchy focals. I’m known for incorporating skeleton keys into my jewelry and other vintage objects. I don’t find them– I hunt for them." 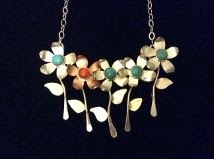 Visit her Facebook page to view many examples of her gorgeous work. And if you happen to be in the Tuscon area you might want to sign up for one her classes at her new studio space. I spent a big chunk of the afternoon cleaning up my blog. One of those necessary evils. I went back to the very beginning of my blog - December 2008. I needed to indicate that all of the things pictured had been sold and to remove broken links. The fun part was looking at all the things I had made, places I had been, adventures I have had and the other artists I have featured. My work has changed - for the better I think! 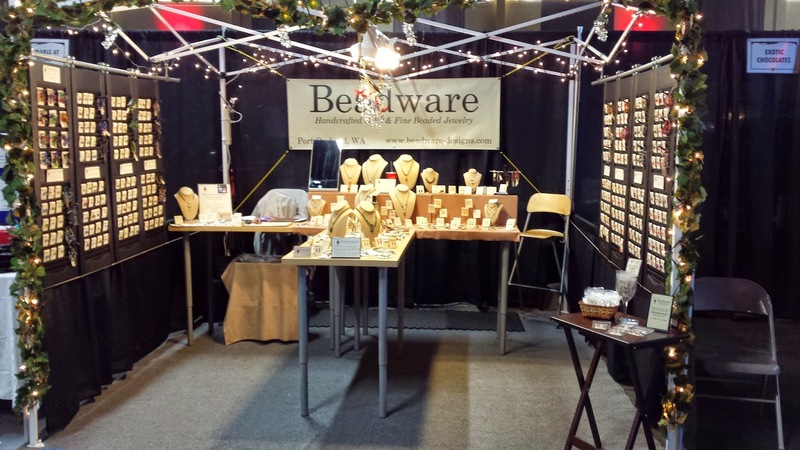 Since Beadware's inception in 2001 I have made more than 780 necklaces, 1400 bracelets, and 4200 pairs of earrings!! I have attended 160 public events with my mobile shop and held 27 home studio shows. How do I know all that you wonder? Well I am queen of the spreadsheet. Just ask my accountant! I have several more tedious tasks on my list - updating my photo gallery, re-filling my online store, cleaning my studio....the list never ends. But I am thankful I am able to do something I enjoy and something creative for a living. Jumping full time into Beadware in 2010 was a huge leap of faith. The sacrifices have been worth it and I have had some fun adventures along the way and made many new friends. Magnolia 2010 - the park did not turn off the sprinklers over nite. Guess whose tent had a sprinkler head in it!! I am very thankful to the friends and family that have supported my efforts. Especially friends that bought my earlier work! I am also thankful to my growing list of customers. Your kind words and continued support are a big part of what makes this such a fun job! I usually buy my turquoise at a trading post in Gallup New Mexico. I like their selection and prices. Although, prices were up this January when I was there. They tell me American turquoise is becoming scarce. 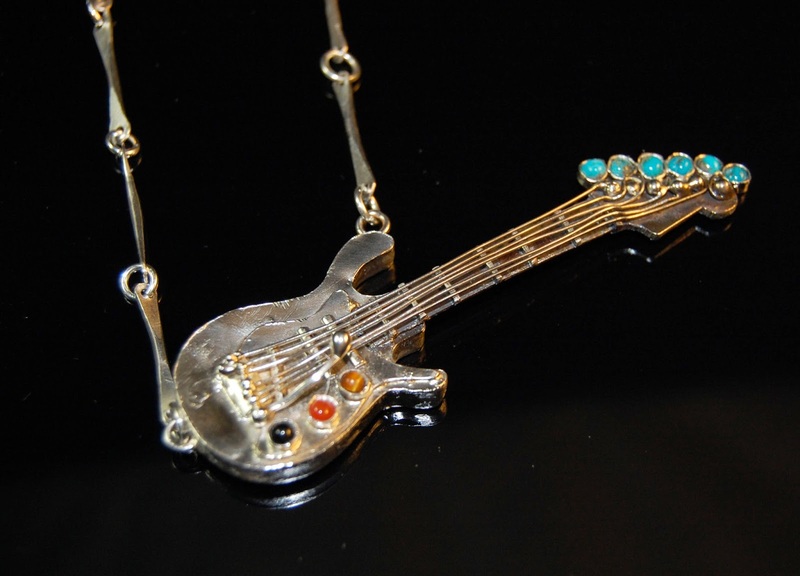 If you have old American turquoise form the 70's and 80's hang on to it! 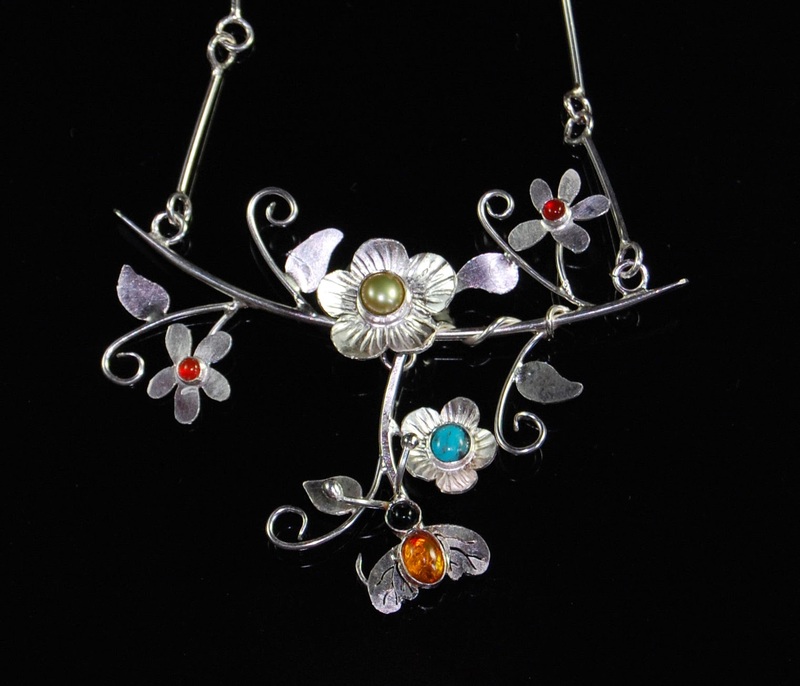 I am heading over to the Chelan Art Festival this weekend. Here are a few new designs folks there will see in my mobile shop. The teardrop is magnesite and the rest of the beads are turquoise. The earrings have been SOLD. The earrings in the bottom center have been SOLD. The earrings on the left and right have been SOLD. Turquoise brings happiness and good fortune. Birthstone: Sagittarius (Archer): Nov. 22-Dec. 21. Wedding anniversary: 5th year of marriage. Care and treatment: The stone's color and lustre tend to deteriorate with exposure to sunlight, heat, or various weak acids. Avoid hot water and household chemicals. Relatively soft so avoid scratches and sharp blows. Make sure certain coatings are not removed. Disclaimer: Stone trivia is provided for curiosity only and is in no way meant to be medical advice. Check out this very cool stone!! I had a grab bag of assorted stones I got from somewhere and decided to use a few of them this past week. It took me a bit of searching, but I was able to identify this very interesting stone as turritella agate. The stones in the earrings are double drilled so I tried something different with them. Copper is such a fun wire to play with. And it is very forgiving! If my customers like this set then I will have to order some more of this beautiful stone. First thing on my work bench was a necklace where the pendant was just not hanging right. So I did a quick re-do. The stone is Owyhee jasper from Oregon and it is mixed with copper and glass. I pay attention to what my customers look at when they are in my booth. The blue necklace below actually had the brown and tan stone that is in the following picture on it. It ever got any attention. So I removed the brown and added a new fluorite pendant to it. We will see if this is more popular. So now the brown and tan Owyhee jasper pendant needed a new home. Next up were two Snakeskin jasper stones that had been sitting on a corner of my bench for months. They both have streaks of a gray-blue in them so I picked a coordinating color glass seed bead to set that off. The pictures do not do the stones justice. Both have been SOLD.